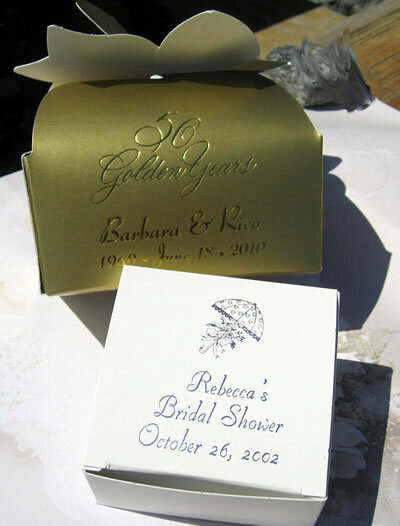 Favors are a way of spreading joy and showing your guests your appreciation for sharing your special day. Favors are not a requirement, but they are a fun way to share your memories. All of the elegant Boxes Winfrey’s offers can be personalized with both your names and date and your choice of standard clip art. We require two weeks notice and a 50 box minimum to print the boxes. You can print two lines of copy and select one design from our extensive selection of standard clip art. This box can holds 4 pieces of chocolate. Available in: White, Brown, Ivory, Kelly Green, Pink, Raspberry, Royal Blue, Red, Black, Gold and Silver. Size: 2 ½" x2 ½" x 1 1/8"
This beautiful favor box is our best selling personalized box. Put your special message on this box to create your own elegant favor. Holds two chocolates of your choice. Size: 3 ½" x 2" x 1 ¾"
Includes: 1oz Starfish, quarter oz small shell foiled and chocolate rocks make up this beautiful presentation for a Bridal or Baby Shower. Change out the Starfish for a Baby Carriage or something similar for the same price! Customize your ribbon to add an extra touch! 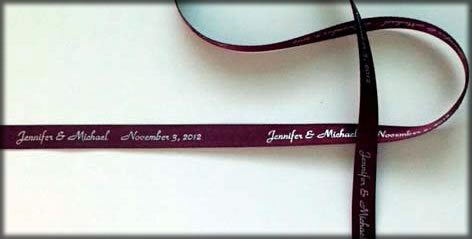 Print your ribbon with your Name and Date in colors too numerous to list! Chocolate Molded Pops are very popular for shower favors, birthday parties, and baptisms. 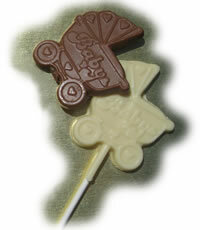 Add a little fun to your special occasion with a Winfrey’s Chocolate Pop. Let us prepare our pops with ribbons and bows to make your party a perfect success! 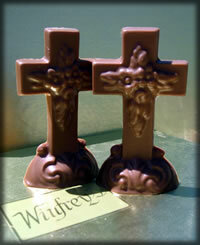 If you would like, we can manufacture your chocolate favor without a stick. Longer lead time may be necessary. 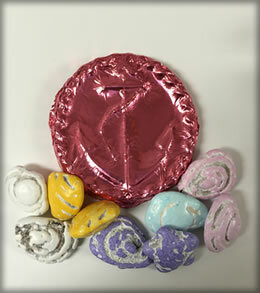 Add a bow to your favors for .25 cents more or order personalized ribbon for that extra touch! *Call for additional pops available. 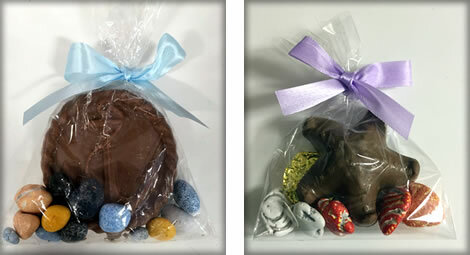 Your guests will really enjoy these delicious chocolate favors when you celebrate your special event. 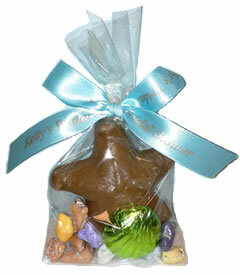 Favors can be ordered and picked up at any of our stores.